1GoOpti is expanding in Italy! After covering the route that follows A4 highway and connects Trieste with Milan, GoOpti decided to expand by going south, travelling on the ancient Roman road Via Emilia, and connecting Milan and Piacenza with Rimini and all the cities in between. And so the GoOpti routes map just got a new addition and became a wide spread network of routes that connect all the major Northern Italian airports with the main cities and towns of the region. Parma, Rimini, Reggio Emilia, Imola, Forlì, Cesena, Faenza and Piacenza: these are the eight new cities that GoOpti will connect with its transfers to airports. 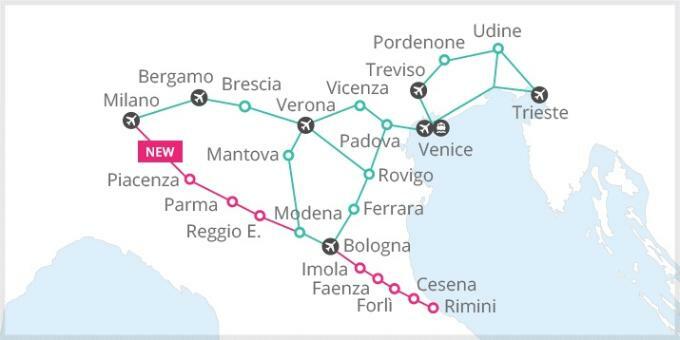 After GoOpti "conquered" Bologna and Modena in spring, transfers on new routes are available to book from 15th October. Reaching Bologna, Milan Linate, Milan Malpensa, Bergamo and Verona airports from Emilia Romagna region is a problem no more! GoOpti transfers are 100% reliable at any time, even if only one person is travelling. The assistance and emergency service is available 24/7 and door to door service is a no brainer. Thanks to this customized option, the new passengers that will be picked up in Parma, Rimini, Reggio Emilia, Imola, Forlì, Cesena, Faenza and Piacenza will start their fantastic journey right from their doorstep.